Coming August 6, 2019! Available for pre-order on Indiebound.org, Barnes and Noble, and Amazon (Click on your favorite online retailer to order)! Now that budding scientist Curious McCarthy's dad is going back to work, the five oldest McCarthy kids will be helping more with chores and taking turns cooking dinner. When her parents present the daily chore chart, Curious is delighted that they forgot to assign her a task. She spends the next week trying to go unnoticed and chore-less as she learns about chemistry and observes it at work right in her own chaotic home. Her funny footnotes capture all the details of her observations for readers, who can then try their hand at science with an included experiment. The addition of a glossary and questions for the reader make this a great choice for libraries. When the power goes out at home, young scientist Curious McCarthy hypothesizes that when there is no electricity at the house, one of the seven McCarthy kids will get in trouble. The power comes back of before the hypothesis is proven true, but Curious's interest in electricity has been sparked. Using funny footnotes, Curious shares her observations of school and home in a crazy story featuring electrons, arm wrestling, cooties, and batteries made out of fruit! A glossary, discussion questions, and writing prompts provide reading support, while a related science experiment adds to the fun. After fourth-grade scientist Curious McCarthy observes her dad fixing their doorbell, she starts to wonder about the science of sound. Meanwhile at school, it's time for Curious to pick an instrument for band. Curious chooses the flute, but the band director says Curious's lips are all wrong for the slim woodwind. Can that be true, and if it is, can science help Curious find her perfect instrument? A sound-related science experiment will have readers putting the story into action, while a glossary and reader questions support the text. 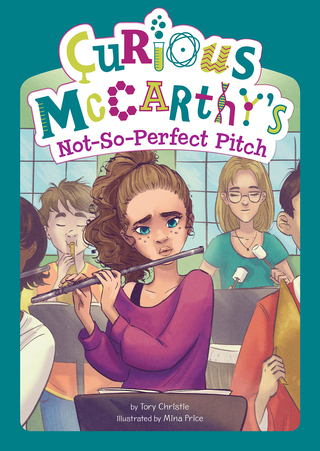 Curious McCarthy, named after the famous scientist Marie Curie, has decided to become a scientist herself. Her first hypothesis: That her mischievous younger brother will get noticed before her proper oldest sister, Charlotte. Using footnotes filled with funny observations, Curious invites readers to read her observations about her first days at a new school with an old-fashioned teacher and her entertaining evenings at home with her six brothers and sisters. A fun experiment brings the science to life and a glossary and discussion and writing prompts provide reader support.